The music, games and DVD retail chain Zavvi is to disappear from the High Street, with its remaining stores to be either sold or shut down. Zavvi's administrators said 446 jobs would be lost after the closure of a further 18 stores by 20 February. However, 10 other Zavvi stores have been sold, and a further three are also expected to find a new owner. 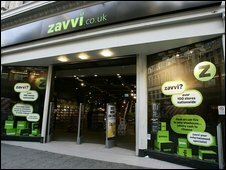 Before its demise, Zavvi had 114 stores in the UK and 11 in the Irish Republic, and employed 2,300 full-time staff. The Zavvi group was formed after a management buy-out of the Virgin Megastore division of the Virgin Group in September 2007 and, until its collapse, was the UK's largest independent entertainment retailer. It ran into trouble when its main supplier - Woolworths' unit Entertainment UK (EUK) - went into administration in late November. Zavvi itself went into administration on 24 December. Since then the chain's stores have been steadily shut down by the administrators. The latest set of stores to be closed include its shop on London's Oxford Street, which has 140 full-time employees. Other stores to be shut include those at Milton Keynes, Bristol Cabot Circus and Manchester Trafford Centre. However, administrators Ernst & Young (E&Y) said they had sold five stores to HMV, which takes to total number of Zavvi stores bought by HMV in the UK and Irish Republic to 19. Another five stores are being bought by Head Entertainment - a business which is jointly led by former Zavvi chief executive Simon Douglas. Head is also buying all remaining Zavvi stock. E&Y also said that Head was set to buy a further three stores, although this deal has yet to be finalised. The administrators said that the stores sold would no longer trade under the Zavvi name. "I would like to thank all of Zavvi's staff and customers for their commitment and continued support for the business throughout the administration," said Tom Jack, joint administrator. "Whilst it has not been possible to secure a sale of the business as a going concern, we are delighted to have been able to secure continued employment for 629 Zavvi employees".